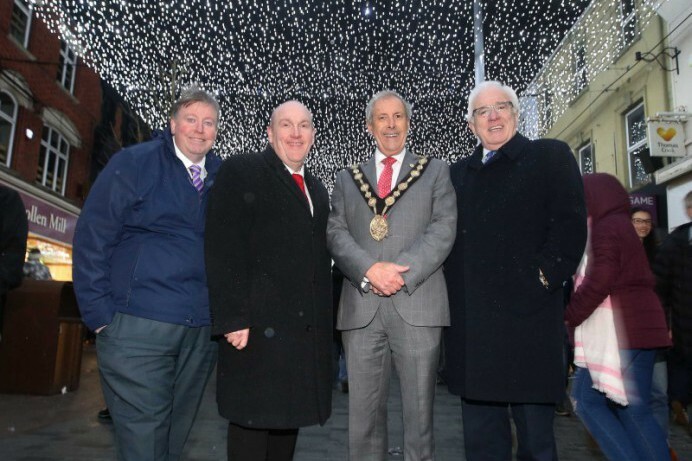 The Chairman of the Development Committee, Alderman William Leathem, was at the launch of the spectacular Light Festival in Lisburn City Centre last night. The Lisburn Light Show will now run every night until 25th January at 4pm, 6pm and 8pm. Local retailers and businesses have been working with the Council to develop and fully support an events and festivities brochure in the City Centre, which coincides with shops opening later in the evenings to encourage Christmas trade in the City. The majority of the city centre shops, cafes and restaurants will remain open until 7pm during November and until 9pm during December. Council controlled Off-street car parking is charged at £1 for 3 hours and parking is FREE every Saturday in December. Alderman William Leathem, said: “There has been a tremendous reaction to the Light Festival launch at the first Light Show which took place at the Christmas Switch-On last night. We really want everyone to come out and experience the Light Festival as it is amazing. There are a number of events taking place in the city centre through to the end of January. Santa will arrive with ten lovingly hand decorated reindeer at the ‘Meet Santa’s Reindeer’ event in Market Square tomorrow (24th) from 12.00pm - 4.00pm. The Frock Around the Clock Fair, is next Saturday 1st December at 12 noon in Market Square with 30+ Christmas Craft stalls. “Of course we also want to remind everyone what we have in Lisburn and to shop locally. We have great shops in our City Centre including men, women and children’s clothing stores, department stores, sporting stores, gift shops, jewellery stores, discount stores, beauty salons, perfumeries, restaurants and coffee shops to mention only a few. We have a strong mix of high street and independent retailers as well as a number of open air markets, so let’s get behind them and support them. “High streets across the country are facing stiff competition and it is vitally important that we show our loyalty to the shops and businesses across Lisburn and Castlereagh. And facing stiff competition from online, we want to offer a full Christmas experience, which is much more than simply a click of a mouse on a keyboard. “We all want the same thing, a great community spirit and to see our area, including the City Centre thrive and prosper. I am delighted with the feedback on the Light Campaign and look forward to seeing local people, and visitors from further afield, come to Lisburn,” said Alderman Leathem.